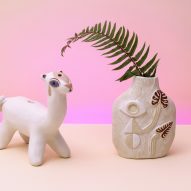 American ceramicists Emily Rae Counts and Jessie Rose Vala have designed a collection of eclectic stoneware, featuring an array of designs inspired by nature. 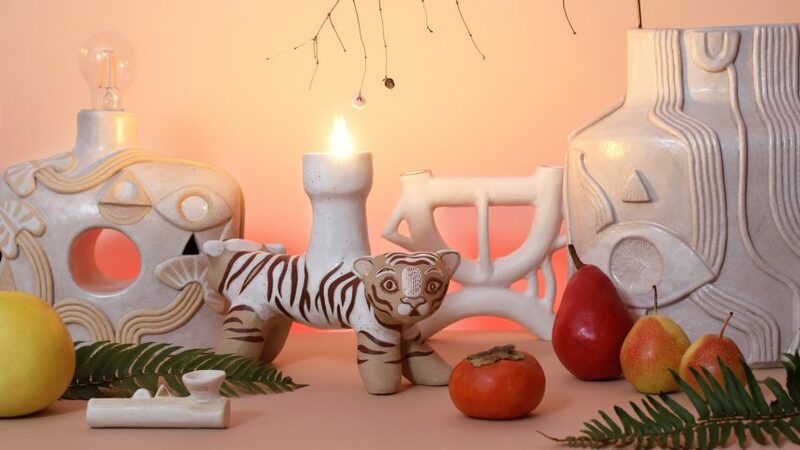 Ceramic tigers and alpacas double up as candle and incense holders, while lamps and vases feature clay vines growing across their surfaces, as well as evil eye symbols. 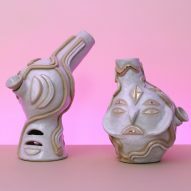 The pair make up ceramic studio Vala Rae, collaborating on the pieces from their respective homes in Washington and Oregon states in the Northwest of the US. The duo describe the region as being "at the edge of the Ring of Fire region where volcanoes, rain and the evergreen trees reign supreme." 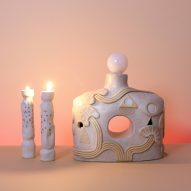 Taking inspiration from these aspects of nature, Counts and Vala's ceramic collection is made up of hand-crafted lamps, candle holders, vases, planters and bongs that are decorated with crystalline shapes, leaf prints and spiritual symbols. "Ultimately we are attracted to pattern and shape and the formal aspects of these nature motifs, as in the positive and negative shapes of a tropical leaf, or the repeating striped pattern of a tiger," explained the duo. "The symbols that we are attracted to and recur in our relief patterns, such as the eye symbol, are often imbued with significant meanings as well as the beauty of symmetry and shape," they added. Each object is hand-crafted from slabs of clay and extruded clay forms. Additive processes are also applied to some of the pieces, where various clay shapes are attached to the ceramic surface using slip techniques, to create relief patterns and images. The objects are then bisque fired, and then fired again to set the glaze, and sometimes go through a third firing process if the designers have added details with further real gold lustre glazes. When designing the stoneware, Vala Rae focused on form and kept the colours minimal, opting for glazes primarily in white, cream, beige and various off-white hues. Maintaining a neutral palette of glaze also helped retain uniformity in the collection, as while the duo develop most of their ceramics as a team, some of the pieces are the result of individual visions and explorations. 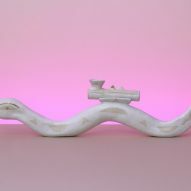 According to the designers, their ceramics are designed to be integrated into people's daily lives and routines, acting as both art objects and functional items in the home. "The pieces are created by hand with thoughtfulness and care, and hopefully will inspire moments of joy or contemplation," said the studio. "Even a brief minute to slow down during a busy life, to appreciate and use an object, can become a daily a ritual." Barcelona home accessories brand Octaevo also recently launched a line of ceramic trays based on Greco-Roman gods, which feature traditional symbols of good luck that are believed to fend off evil spirits.